Dimensions 0 by 6.30 by 9.69 in. Amazon.com description: Product Description: From 1970 to 1977 a major project to uncover source material for students of contemporary British history and politics was undertaken at the British Library of Political and Economic Science. Fiananced by the Social Science Research Council, and under the direction of Dr Chris Cook, this project has attempted a unique and systematic operation to locate, and then to make readily available, those archives that provide the indispensable source material for the contemporary historian. This volume (the fifth in the series) provides a guide to the papers of propagandists who were influential in British public life. Included in this volume are the papers of such persons as newspaper editors, leading economists, social reformers, socialist thinkers, trade unionists, industrialists and a variety of theologians and philanthropists. In all, this volume not only completes the findings of the project but opens up the archive sources of a hitherto neglected area of research into contemporary social and political history. 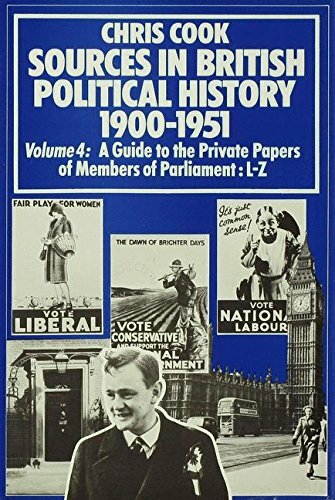 About: From 1970 to 1977 a major project to uncover source material for students of contemporary British history and politics was undertaken at the British Library of Political and Economic Science.